Evolve's new Arena mode, announced by Turtle Rock Studios earlier today, is just what it sounds like. Instead of a hunt, it's a brawl inside one of five domed environments placed on each of the game's 14 maps. The basic hunters-versus-monster gameplay remains intact, but the new mode works under a few different rules. Matches are best-of-three contests, with each round fought under a different dome on the same map. All hunters and the monster start with one perk; the monster begins at stage two with 50 percent armor, but can feed on the wildlife in the dome to regain armor and possibly evolve to level three. If you get wasted in battle, you're out until the next round—there's no dropshop timer—and players won't be able to change characters or perk selections between rounds, although monsters will be able to select different abilities. The gameplay on display in the video released today seems pretty clearly less strategic than in the standard game mode, but strategy and stealth elements are still important. "The hunters and the monster do not start out looking straight at each other," the narrator explains. "So you have time as a monster player to sneak around, perhaps get a little nibble of food, or as the hunters, to set up some traps." 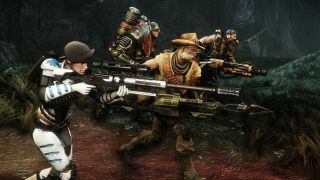 "Obviously, if you’re looking to get competitive with Evolve, something like an Arena Mode is going to be awesome to play—or watch," Turtle Rock wrote. "That’s just a taste of things to come."